Ready or not—it’s time to shop for a swimsuit! After cold months of thick sweaters and heavy coats, just the thought of standing almost naked in front of a dressing room mirror can send fear into the heart of even the most avid shopper. It's inevitable, but the time is now to shop for a swimsuit. By shopping now you take advantage of the best selection in swimwear. More choices, means you'll find your best suit of your dreams. Since a new swimsuit is an investment-let's make a smart choice here. This week's article (posting on Thursday) will give you your best swimsuit options based on YOUR body shape! Relax, we all get a little anxiety when we start think about needing a new swimsuit. Wearing so little can be daunting...until the weather changes and it's super-hot and you can't wait to splash into a pool of cool water. The right swimsuit will give you confidence. Have you ever declined an invitation to pool party or the beach because the invitation said, "Bring a swimsuit and towel" ? Many of us have…but it will NOT happen this year. With this week's suit selections based on shape (and areas you want to hide and minimize-like a tummy) you will know your best suit options. This season find your best... and get out there and enjoy yourself! Your kids will soon be nagging you to take them to the pool—so start looking NOW while the selection is good. If you wait, the kids will be out of school you will have to take them with you shopping AND the selection will have dwindled to nothing! If you procrastinate (like most of us want to) you won’t get the swimsuit you deserve! Even worse you may be stuck wearing last year’s worn-out one—yuck! It’s never easy to peel off those winter layers and show some skin when the season finally arrives. Especially when you know you must face the unfriendly fluorescent lights of the dressing rooms—they have a way of making every woman’s thighs look like crepe paper—not nice! If you are fair (like me) your skin can look pretty ghostly from winter hibernation. Perhaps a little self-tanner will hide our imperfections and give our lily-white gams a little glow? Consider applying a layer of self-tanner a couple of days before swimsuit shopping to give it a chance to build up a ‘tan’. We all have a little something to hide—trust me. It’s only natural, but finding the right swimsuit (and cover-up) will give you the poise you need to get out there. I just purchased a new swimsuit for this season, but it took a lot of trying on. I knew which styles to look for (based on my shape). However, I found it particularly hard to shop because there was a lack of swimsuits for women 40 and up. Where are the “older” women supposed to shop? So many swimsuits had unsupportive tops and bottoms the size of postage stamps! Give me a break! REAL women need REAL coverage (more fabric please) for goodness sakes. Either a teen or grandma. I found a gazillion cute swimsuits for teens that are more interested in style than bust support and bottom coverage. I found fab swimsuits I know my mother would love for her senior water classes. But, what about me? I know there are lots of women in my age group (40-50's) that want and need a good-looking swimsuit! After an extensive search I did finally locates a few stores that have everything we need and want in a swimsuit. This week I'll also be sharing my swimsuit shopping tips with you—as well as best suits by shape. It's my pleasure to help make your swimsuit shopping experience less stressful. yet we don’t want anyone to see us try them on?! Don’t procrastinate! Right now stores (and websites) offer the best selection of swimsuits, cover-ups, and accessories. Now's the time to get what you need to make this summer your best. 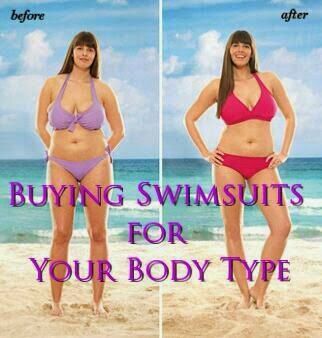 This week let MSP help you find your “perfect” swimsuit. The Personal Profile shopping guides at MissusSmartyPants will be full of fabulous swimsuits, cover-ups, hats, totes, and more! You’re bound to find the swimsuit of your dreams. I’ll also share style tips to help you minimize the not so great parts and play up your good bits. We all have tummies, heavy thighs; small or large busts, etc...the right swimsuit can help draw the eye away from these areas and show off our fabulous features. This Thursday-- get ready to make a BIG SPLASH with your best swimsuit ever! ORDER your weekly Personal Profile & Start Your Style Journey Today! What's MSP Been Up To? For starters...last week was very busy. Sunday was brunch with hubby and friends. We went to Monte Cafe located in an upscale shopping center. Since we were out the the night before, were rather late when we arrived for brunch. But, lucky for us, they serve breakfast all day at this cafe! As the weather warms up, our skin gets more oily. This means more possible skin breakouts. Urgh! Don’t let this happen. CLEAN makeup brushes and supplies means you’re less likely break out. This week’s Style Mission is: Gently clean all of your makeup brushes (or replace your old ones). 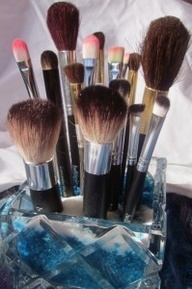 To clean your brushes simply use a gentle soap or facial cleanser (or use this DIY brush cleaner). 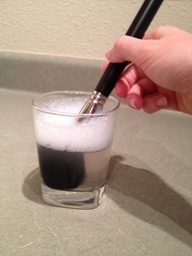 Swirl around brushes to clean, then rinse with clean water. I just started my membership a little more than a month ago. After joining your site, I purged my closet. Everything was too old, I might wear it again some day, what if I gain back that weight I lost? Since I have started wearing the things that you have suggested for me, I get compliments all the time on how put together I look and how cute my clothes are from people I don't even know. I came home today and a neighbor was in my driveway. She said, "You always look just like someone in a magazine!" (I was wearing a pretty scarf and a cute black jacket w/my jeans.) Thanks for all you do to help us look our best! I've been a subscriber for two years now and many of the testimonials that I read on your Tues. mailing sound just like me: learning new things and feeling very happy about it. But right now I just want to say that your MSP e-mails every week are just plain FUN! I don't have a whole lot of time to spend on myself (I homeschool my sons, have a part-time business at home, and am active in my church), but I really look forward to reading MSP. It's my down time . . . my kick back time . . . my "Me" time! P.S. Someday I'll get around to sending you some pictures so you can see how you've helped to change me--for the better! You are so right. Style should be fun! What we choose to wear is a fun way to express ourselves. It's also a great way to self-nurture--so it's a good thing to do. As busy women, we need to give ourselves a little 'me time' so we can re-charge our battery. Enjoy your kick-back time and don't feel guilty about it...instead learn about dressing for your body type and enjoy being that beautiful woman you were always meant to be! I just wanted you to know that I have had more compliments and owned fewer clothes than ever before since I joined you. I love the liberating feeling of having “permission” to ditch clothes which don’t make me look or feel good even if they are not worn out and they still fit! Last week I wore a black animal-print scarf which I had tried to wear the week before but with THAT outfit it made me look too “dumpy” for some reason – proportions all wrong (although I am still amazed that I was able to notice this for myself!). It was left hanging on the wardrobe handle ready to go in my next charity shop bag. However, when Friday came around and I was off to work in a plain black v neck jumper and jeans – it was just the thing to lift my look. My boyfriend even commented that I looked very “French” and stylish and I also received several compliments at work…on a Friday! AND I listened to your Blog Talk radio show for the first time last week - wrote down your list and then went straight home to see how many items I could cross off out of what I had already.....and there were more than I expected.